This link takes you to a list of 109 places around the world with Pemberton as part of the name of the place: http://www.geonames.org/search.html?q=pemberton&country=. A click of the mouse gives you a map of the world wide scope of the Pemberton name. Below are short notes about a number of the more interesting or famous Pemberton Places. Pemberton, Wigan, Lancashire, England The birthplace of the Pemberton name? Because this Pemberton place is the historical source of many of the branches of the Pemberton surname, we give it a bit more detail than the others. 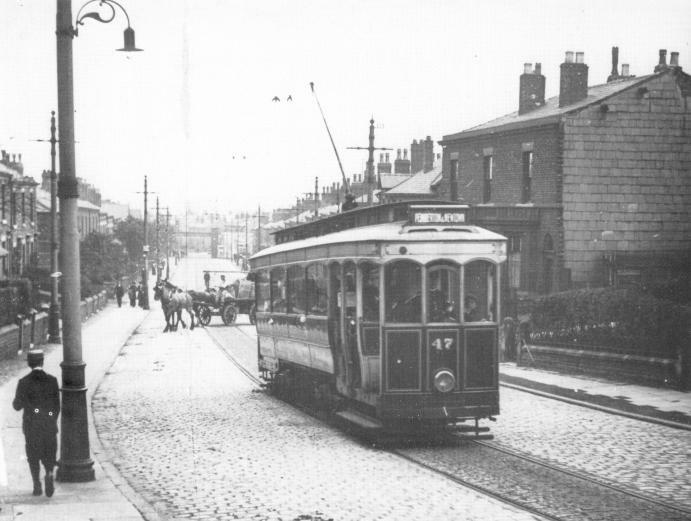 The photograph is a tram in old Pemberton. The following description of Pemberton near Wigan is interesting because it comes from the Topographical Dictionary of England, by Samuel Lewis, and was first published in 1848. By 1835 Pemberton was a township in the parish of Wigan and was adopted under the Local Government Act of 1854. Later, in 1894, it became an Urban District Council. However, as early as 1904 an inquiry was under way to look into an application by Wigan Corporation for an extension of the Borough boundary by the inclusion of the District of Pemberton, and despite local resistance, it was agreed to do so in April of that year, and in November the final meeting of the Pemberton District Council took place. In 1974 the district of Pemberton was formally dissolved and added to the borough of Wigan. The name Pemberton appears in documents as early as the 12th century. The name Norley or Northlegh first appears in 1292. 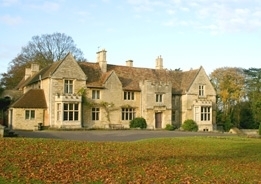 It is thought that Norley and Pemberton were part of the same manor originally but became split into separate manors and later joined together through inheritance through the heirs of Thurstan de Norley. The manor rights to Pemberton eventually passed to the Legh family of Lyme. A Legh terrier of 1466 mentions the existence of Norley Hall, Kit Green or Kytte Green, Lonemerehed or Lonemerehedgrene (Lamberhead Green), and Hawkley Hall. Hawkley Hall belonged to the Molyneux family who were related to the Sefton Molyneux. The Hall was demolished in 1971. Hindley Hall was owned by the Bankes family of Winstanley Hall. Worsley Mesnes was owned by the Worsley family who also owned Worsley Hall. The family’s lands were later owned by the Downes family (Roger Downes represented Wigan in Parliament in 1601 and 1620. A monument to his grandson Roger is in All Saints Church, Wigan.) The lands were later held by the Duke of Bridgewater. Local Boards were set up in 1872 and then changed by the 1894 Local Government Act to an urban district council which was dissolved in 1903, to become part of Wigan County Borough. A hospital was erected in 1886 by the local board. The land which was to form Alexandra Park was given by Colonel BH Blundell, a local coal mine owner, in 1903. St John’s Church was consecrated in 1832. St Matthew’s Church was built in 1894 and replaced the old iron church and school owned by the Blundell’s who also paid for the building of the new church. St Mark’s was built in 1891. St Cuthbert’s RC church dates from 1872 and was enlarged in 1887. A new church replaced this in 1966. St Edward RC at Newtown opened in 1927. St Aidan RC dates from 1972. St Paul CE opened in 1915. The principal industries were coal mining, cotton spinning, quarrying stone, brickmaking and ironfounding. Many pictures of old Pemberton can be seen on the wiganworld.co.uk website. And here is the Victoria history of Pemberton. We need a picture for this Pemberton place. If you have one or can get one, please contact technologist@pembertonfamily.com. AT NORTH PEMBERTON STATION 29.6 m. [29.6 miles along this tour route] the highway crosses the Pennsylvania R.R. at grade. this point has long been known as Comical Corner, apparently for no reason except that a county and a township road meet at the railroad. PEMBERTON, 30 m. [30 miles along this tour route] (75 alt., 783 pop. ), is a quiet old farm center whose streets disclose the sturdy frame and brick residences of middle-class occupants. Old trees shade the streets and wide lawns. Time-stained houses attest the age of Pemberton, which largely escaped damage during the Revolution because it was a few miles off the line of marches and raids along the old King’s Highway. Many of the residents, owners of large farms, now live in the town, while “renters” till the fields that have been owned by the same families for generations. The business section consists of a number of small stores in a single block. Three well-filled cemeteries with grilled iron fences are on the main street. The Pemberton district was settled by Quakers before 1690. Among the older buildings are the”Gristmill (R) on Main St., still doing business, and the old Pemberton Inn, SE. cor[ner] Hanover and Elizabeth Sts. The inn is a very long two-and-one-half-story brick building of strong Pennsylvania Dutch influence. It is flush with the sidewalk, with a narrow fanlighted door. Across part of the front is a one-story porch with an ornate wooden railing. The inn closed after the prohibition act was passed. The bar corner is unoccupied; an antique shop and three other stores occupy the rest of the ground floor. Pemberton was first called Hampton Hanover because it lay in both Northampton and Hanover Townships. Later the name was changed to New Mills, and in 1826 the present name was adopted in honor of James Pemberton, a Philadelphia shipping merchant. Pemberton’s Parlour, otherwise known as the Goblin Tower or Dille’s Tower, stands on the northern section of Chester’s city walls. The red sandstone crenellated tower has an arch leading to a semicircular chamber with seating which faces the walkway of the walls. Above this are three panels, the lateral ones containing the royal arms, and the arms of Chester in relief. You can see pictures and read more about the “parlour” which was once used as a place to collect taxes, here and here. Here is a picture of main street sent to us by Brett Pemberton. This picturesque castle is in Austin, Texas. Your author has requested permission to reproduce their history and pictures here so they will not be lost when their website goes dark. 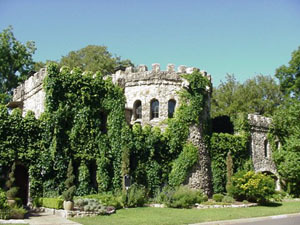 Meanwhile, here is the link to a history with picutues: http://pembertonheights.org/History/History_Castle.htm or http://pembertonfamily.com/society/43/96-pembertoncastleaustintexas.html. 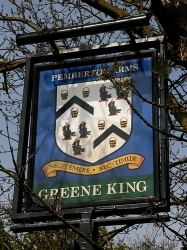 Pemberton Arms, a Greene King pub a couple miles South Southwest of Cambridge, Cambridgeshire, UK. The coat of arms used by this pub on its street side sign originated with one Robert Pemberton of St. Albans. Photos courtesy of Steve Linley. The exact location of this manor is apparently unknown, but records point to an area in or adjacent to today’s Pemberton about a mile West of Wigan, Lancashire. The discussion is one I refer to as “The Edusa Case” because it is taken from the records relating to the petition for dowager rights by the wife of the first Alan [de Pemberton] against the younger Alan. [See Chart 1 of the book Pemberton Pedigrees.] The record of the case is reported to be “much mutilated” and to me makes very little sense as reported in the Victoria Histories. The Victoria leaves great questionmarks as to who the people were, how they were related (if at all in the case of the Henry and the Aldith) and who lived where and when: but most importantly whether the De Windle came first or the De Pemberton. In the section “manor” Victoria states that it was a son of a Pemberton who settled at Windle and became known as Alan de Windle, whereas in the case reporting itself it states that an Alan De Windle was the owner of the Pemberton lands and his son was the first to be called De Pemberton. The writer of the Victoria is to me confused in placing who was who and might even have created two seperate people from the same person (the first/Senior Alan De Pemberton and Alan De Windle) as a result of failure to understand the history as a reuslt of the “mutilated” original pipe roll. What is clear from Victoria is that the original line died out sometime just after 1367: therefore if anyone is related to this line they are from younger son stock not the direct/original Lords of Pemberton line. Either that or they are from a line who simply lived at Pemberton but were probably not related to the original Lords of Pemberton. Before the Conquest, as afterwards, PEMBERTON seems to have formed one of the berewicks or members of the manor of Newton. It is so regarded in the inquisitions. During the 12th century it was held in thegnage by a certain Alan, whose son Alan, settling at Windle, was known as Alan de Windle. At the Survey of 1212 the latter was holding Pemberton, assessed as two plough-lands, by the rent of 20s. and the service of finding a judge for the court of Newton. (fn. 11) Like other Windle properties this mesne lordship may have descended to the Burnhulls and Gerards; no record of it occurs in their inquisitions, but Sir Thomas Gerard, who died in 1621, held certain lands in the township ‘of the lords of Pemberton.’ It seems, however, to have been alienated to the Walton family, and so to have descended with Northlegh or NORLEY to Legh of Lyme. The first Alan de Pemberton had created a subordinate manor for a younger son, known as Adam de Pemberton. He in 1212 was holding it of Alan de Windle, and had granted out a quarter of it to Henry son of Lawrence, who in turn had granted an oxgang, i.e. a quarter of his share, to Alan son of Aldith. Adam de Pemberton made grants to the Hospitallers and to Cockersand Abbey. He was still living in 1246. His descendant William died about 1292, leaving a son Adam, who in 1331 made a settlement of the manor, his son William, who had married Eleanor, being the heir. Note that the above is heavily footnoted in the original and the reader is advised to visit the Victoria History of Lancashire for further information. Also of interest is the burning well at Pemberton, which some think may have been a valuable asset in the earliest times, its being a perfect integration of earth, fire and water, all of which were considered the fundamental elements of nature and figured importantly in the early religion of the area. The site of this burning well is documented in footnote 6 in the history just cited. Click·here to see the picture of Coca-Cola’s Pemberton Place. An old map titled “A NEW MAP OF BARBADOES wherein every Parish, Plantation, Watermill, Windmill & Cattlemill is described with the name of the Present Possessor, and all things els Remarkable according to a Late Exact Survey thereof” shows a Pemberton cattlemill 6.7 miles west of the eastern most tip of the southern part of the island. Power for the mill was supplied by cattle walking round and round whilst it ground sugar cane. It is located within the parish of St. Johns. The St. John’s Parish Church is located just 2.2 miles northeast of the plantation and its records include several Pemberton life events: christenings, marriages and deaths. The map is in the possession of the Pemberton Family World Wide and a portion of it can be viewed online in the hard copy section of the PFWW Family History Library. From the early 13th century until 1929, Rushden Hall was home to a succession of local squires, in particular the Pembertons, Ekins, Fletcher and Sartoris families. The Pemberton’s long association with the hall (nearly 200 years) began shortly after 1460 with Robert Pemberton who was MP (Member of Parliment) for Northampton, High Sheriff and Usher of the Chamber to Richard III. His grandson, another Robert Pemberton lived in Rushden Hall during Elizabeth I’s reign. He was one of her Gentlemen Ushers of the Wardrobe, and he and his son, Sir Lewis Pemberton, rebuilt the old, primitive hall as an elegant country house. Sir Lewis Pemberton, High Sheriff of Northamptonshire, who passed away in 1639, was the last of the Pembertons to live at Rushden Hall. The Pemberton family of Trumpington Hall have lived there for over 300 years and is a Pemberton, Lancashire (see above) family. The line begins with Robert Pemberton, born in St. Albans in 1523. He married Catherine Stokes. Your author had the distinct priviledge of a conducted tour of the Hall by its present owner Antony Pemberton in 1998. Antony presented a talk to the Trumpington Local History Group in October, 2008 which details much of the history of this grand old hall and its occupants. That presentation can be read in full here.